Turning an architectural, Late Baroque gem into a contemporary conference centre requires subtlety in no small measure. The results at Raitenhaslach Monastery in Bavaria are impressive thanks to a productive partnership between the owner, the town of Burghausen, and the Technical University of Munich that runs it. What sets Raitenhaslach Academy apart is its impressive interior design. All the rooms are understated in order to show the sophisticated historical details, ceiling frescos, fittings and tiled stoves to better advantage. The historical rooms are used for a variety of purposes and the versatile furniture links the past with the present. Interior designer Andreas Anetseder provided the perfect solution by picking Wilkhahn’s Ceno chair and Asienta upholstered sofa range and developing his own table solution. The history of today’s universities is short compared with the early hubs of science – or in other words the monasteries. In their isolation they weren’t just places of spirituality, craftsmanship and agricultural development, but also educational and cultural centres. This tradition is now being revived in a contemporary manner in Burghausen, Bavaria. 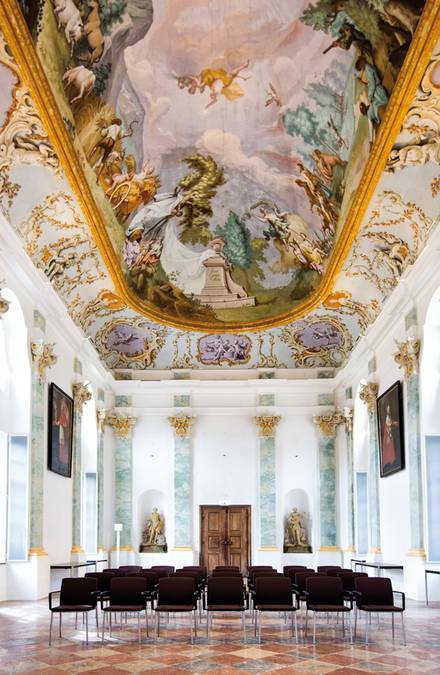 Since the beginning of June 2016, the Late Baroque Raitenhaslach Monastery has been made available to the Technical University of Munich as an academic centre. By carrying out an in-depth survey and by carefully using techniques for listed buildings, the monastery’s Prelate building was documented by the university and transformed for academic use. The building was constructed in 1762 in a picturesque setting on the Salzach river. Now all the rooms have been restored to their former glory and are available to the academic world as places for retreats and conferences. In addition to the beauty of the historical rooms, the new academic centre is also remarkable in that it offers a range of different options. There’s the banquet hall, the Aula major, with its opulent paintings on the ceiling for 190 people. Or 11 seminar rooms or a small study room just 16 sq m in size are also available. The facility offers a whole host of spaces in various sizes and with distinctive atmospheres. Academics have 1,000 square metres at their disposal on four storeys. A new extension allows barrier-free access to the conference venue. The Technical University of Munich is running it, but the rooms can also be rented by other parties for events such as conferences or workshops. In the seminar rooms, diverse settings and layouts are possible for which the interior designer developed a dedicated modular table range. This range can integrate all the multi-media equipment and respond to the acoustic demands of the listed building. Wilkhahn’s versatile Ceno was the ideal choice for the seating. The four-legged chair, created by Berlin-based designers Läufer + Keichel, has a particularly stylish appeal. Its exceptional comfort and crisp design language integrate perfectly with a range of different settings. Ceno’s slight curve underneath the backrest was the reason Andreas Anetseder chose it. The curved shape subtly matches the arches on the Baroque building’s ceiling. The stackable chair also scores top marks for its functionality and noise-absorbing characteristics. An acoustics-friendly fabric cover was chosen for the Ceno seating in the banquet hall. The fabric softens the sound in the listed hall without having to touch the valuable structure of the building. Thanks to the wooden flooring and their sizes, the acoustics in the smaller rooms are better. As a result, the leather covered version of Ceno is used in these spaces and reflects the quality-driven approach of the Technical University of Munich. Due to its form which cleverly alternates between looking formal and organic, Wilkhahn's Asienta upholstered furniture range (designed by jehs+laub) cuts a stylish dash in the historic backdrop. In the lobby, three leather-covered Asienta sofas under a light-coloured groin vault invite people to linger and chat. In its commitment to progressive research, but appreciation of the historic building at the same time, the Raitenhaslach Academic Centre is a place where apparent opposites unite.